Hear the complete opera "Purchase of Manhattan" on WCNY-FM radio at 2pm EST, this Sunday, November 22, 2015! The program Fresh Ink will air the opera in it's entirety, as it was premiered in Manhattan in November of the previous year. ​The premiere took place exactly a year ago on Nov. 20th, 2014 at Marble Collegiate Church in NYC, which was the original “company church of the Dutch West Indies Company” and remains the oldest surviving institution in New York, dating back to 1628. 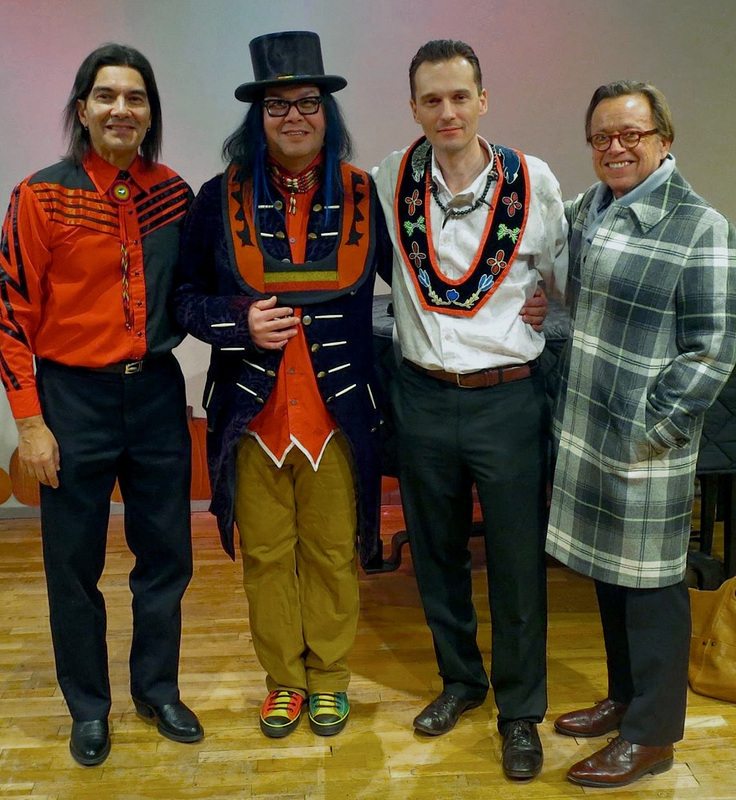 The Lenape Center commissioned the opera from Brent Michael Davids, whose tribe originally lived on Manahatta, to set history straight and de-bunk the "purchase" myth. 450 years ago, Hendrik Hudson sailed into the harbor of the Muhheconnituck, the river that now bears his/Hudson’s name. 388 years ago, in 1626, a brief mention of a so-called “purchase” of Manahatta was delivered by ship in a sailor’s letter. So begins the written history of the island, a place populated by Lenapes, Mohicans, Munsees and other indigenous inhabitants for perhaps 13,000 years before Hudson. 'Manhattan' comes from the Munsee description of the ‘place where we get bows’, in reference to the hickory trees on the south end of the island used to make them. Soon the island became 'New Netherland,' 'New Amsterdam' and 'New York,' following the path of supposed owner-ship transfer. During this time, a Lenape diaspora began as the longtime resident citizenry was systematically driven out. The cultural swap was so complete that even the original meaning of the island has been lost to most modern Manhattan dwellers. Alexandra Loutsion sings the Spirit-of-the-Land, baritone Stephen Powell is a Lenape, and tenor John Bellemer, who is Wampanoag, sings the part of Dir. General Minuit, plus Native American Singers, an opera chorus representing the Lenape people and Dutch sailors, and chamber orchestra, all under the expert hands of conductor Sara Jobin. MANHATTAN: Spirit-of-the-Land introduces Manhattan island before first contact. THE INDIANS: Lenapes sing of life in Manhattan and the importance of Wampum. THE DUTCH: Dir. General Minuit and the Dutch sing of exploration. THE PURCHASE: The Lenape and Dutch meet on Manhattan island. THE AFTER- WARD: A century-long reflection on the founding of New York is recounted. WIPING OF TEARS: A present-day Lenape “Wiping of Tears” condolence ceremony. On November 19, 2014, James Barron wrote a wonderful article on the new concert opera Purchase of Manhattan for the New York Times: "The Sale of Manhattan, Retold from a Native American Viewpoint." As Lenape Center's Executive Director Joe Baker put it, "This opera in many ways is our homecoming ... [we] are retelling the early beginnings of New York City." Well, what most readers may not know, as revealed to us behind the scenes, is that this particular entry was the "eighth most read NY Times article" for the entire year, internationally! For those couple of days, the news about Manhattan's origins fanned out across the planet, carrying with it our indigenous perspective and a recognition of some new music! The performance was epic, a brilliant combination of performers who brought the hall to their feet with cheers at the conclusion. During the intensity of the performance, the rustle of a single cough drop wrapper could have carried across from one end to another—listeners were enraptured. The concert opera premiere becomes one of the highlights of my musical and nonmusical life, and many thanks go to all the Purchase of Manhattan supporters, on the stage and behind it. It's such a proud moment for me, and I especially thank the Lenape Center for entrusting to me, as a composer, a story of such importance. Thanks to Joe Baker, Hadrien Coumans and Curtis Zunigha of the Lenape Center! I remain honored! NEW YORK TIMES—Purchase of Manhattan! James Barron has written a great article in today's New York Times! Here's a sample but please check out the entire article! Tickets are still on sale for this one night only world premiere! "...Mr. Bellemer said that idea came through clearly. 'The baritone' — Stephen Powell, in the role of a Lenape — 'is singing these beautiful lines about hearing the music and the leaves and his mother’s bones being in the ground,' Mr. Bellemer said. 'The juxtaposition is brilliant. It’s the beginning of how these communications between these two peoples are passing ships in the night. They just don’t get each other at all...' (New York Times, Nov 19, 2014; p. A23).